Could the snacks you feed your kids cut their chances of getting sick? Healthy things in everyday foods - from yogurt to fruits & veggies - may help boost a child’s natural defenses. 1. Make your child have yogurt- Ear infections are common in children. They can result in excruciating pain. Yogurt prevents the chances of having an ear infection or a strep throat. They have a major amount of probiotics that help in digestion and are known to combat ailments. 2. Fresh fruits and vegetables can make your child strong- There is a potent reason why every mother makes consumption of fresh fruits and vegetables next to mandatory. Broccoli, sweet potatoes, bell pepper and strawberries help in developing a strong immunity. Fruits and vegetables defend your body from flu and colds. 3. Include lean meats in your child’s diet- Zinc deficiency increases the chances of contracting a disease. Lean meats supply your child’s body with necessary proteins and zinc. Zinc in right proportions accelerates white blood cells to deal with illnesses. 4. 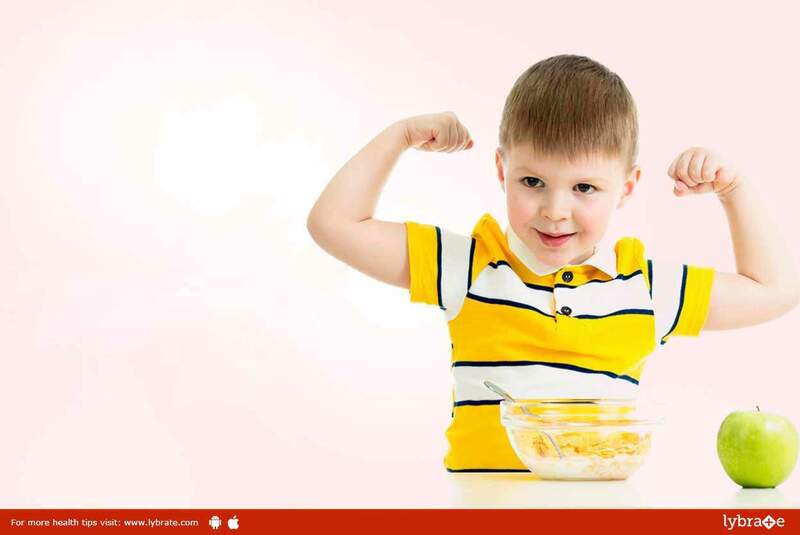 Feed them food items rich in Vitamin D- Fishes like tuna and salmon, egg yolks or cheese contain a high percentage of Vitamin D. Apart from exposure to early morning sunshine, these food items can fulfill your child’s Vitamin D requirements. 5. Try out the benefits of Echinacea- Echinacea is a natural herb that builds your child’s immunity even against severe diseases like cancer. Fresh leaves of the Echinacea plant can be directly consumed. However, for allergies your child needs to eat the root of this plant. 6. Vitamin C is a life- saver- Encourage your child to have fruits rich in Vitamin C. Lemons, oranges, tomatoes, and grapefruit should be eaten continually for improved immunity. These fruits protect children against common cold and other prevalent infections. 7. Nothing matches breastfeeding- Breastfeeding is the fundamental pillar to your child’s good immunity. Breast milk provides a baby with necessary nutrients and minerals protecting them in the long run. It is also known to result in higher intelligence quotient. ← Female Condoms – Know Pros And Cons Of It!